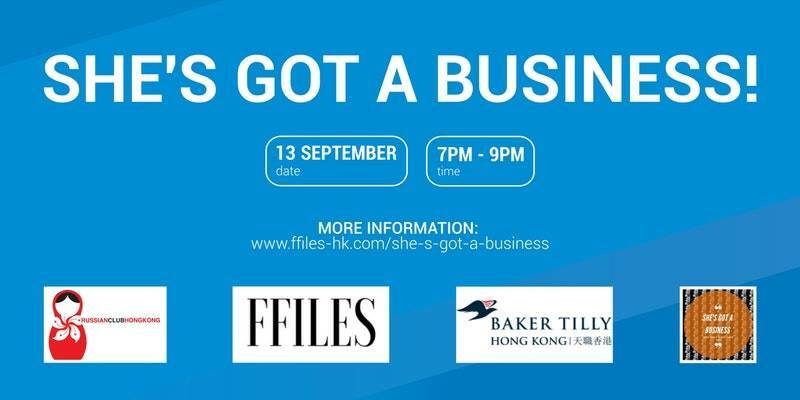 FFILES consultancy started the «She’s Got a Business!» series with the idea to inspire and educate women like you and me about what it takes to start and run a business. These interviews met with great success and this September, with the support of Russian Club and Baker Tilly Hong Kong we are going live! After 2 successful practical events dedicated to starting and fundraising your business we are organizing our first panel event with successful female entrepreneurs. They will share their experience of finding «the» idea, starting their business and challenges they had to overcome to run their business in Hong Kong. The goal of the event is to inspire, educate and connect more female entrepreneurs. Meet with like-minded people, ask questions and exchange new ideas. Sponsored by Baker Tilly Hong Kong. In collaboration with The Italian Chamber of Commerce, FinnCham and The Belgium-Luxembourg Chamber of Commerce, Russian Club in Hong Kong would love to catch the tail-end of summer for you by a poolside terrace at Conrad Hong Kong. This summer splashing fun is what you need in the end of August. На следующей неделе в Гонконге состоится международный турнир по Регби 7. Мы очень рады, что сборная Росси́и подтвердила возможность встречи в среду 5-го апреля. Давайте соберемся пообщаться с ребятам и подзарядить их общим духом победы! Чтобы и здесь, вдалеке от родины, ребята чувствовали нашу поддержку. И, играя за Россию на предстоящем турнире, знали, что все мы, и те кто будет на стадионе, и те кто по разным причинам туда не попадет, болеем за них! Встреча состоится вечером в IQ BAR (Winner Building, 27-39 D’Aguilar St, Central).